Here in the Western world the majority of children have access to anything they might need. In fact, many children are given everything they want! However in the rest of the world this is not the case and children are often the ones who go without the basic necessities of life. Here at Kids Club Kampala we find out the most pressing needs of the children and communities through working with them and listening to their needs. Our supporting basic needs programme was born out of a response to the growing need for basic items that affect the health and wellbeing of each child who attends our Kids Club activities each week. We now work with over 4000 children and their families each week, so there is a lot of need out there. 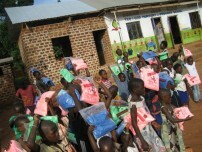 We hold regular giveaways of much needed clothes, shoes, soap, mosquito nets, school supplies and much more for the kids. For the mothers we often hold giveaways of baby clothes and baby blankets. Living in a slum environment is dangerous for any child's health due to the poor sanitation and we have learned not to underestimate the power of clean clothes, shoes, blankets and soap in tackling and preventing infection in these environments. Mosquito nets are also a necessity with large families sleeping together in one room, once one person has malaria all it takes is one bite for it to spread to the next sleeping child.